Mustapha died after suffering from chronic respiratory complication. 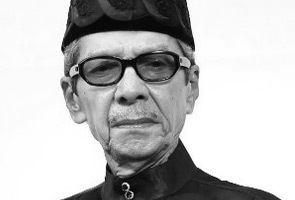 KUALA LUMPUR: Malaysia's filmdom legend, Datuk Mustapha Maarof died at the Tuanku Mizan Military Hospital in Wangsa Maju today at 8.30am, after suffering from chronic respiratory complication. He was 79. Mustapha was admitted to the Respiratory Medical Unit at the Kuala Lumpur Hospital on Nov 25 after suffering from breathing complications. He was then transferred to the Tuanku Mizan Military Hospital in Wangsa Maju for treatment. Born on Jan 1, 1935, the legendary Malay filmdom was synonymous as the leading role in a series of black-and-white movies Bawang Putih Bawang Merah, Sultan Mahmud Mangkat Dijulang, Naga Tasik Chini, Detik 12 Malam, Keris Sempena Riau, Sumpah Pontianak and many more. His sheer talent for acting was discovered after he stepped foot at the Cathay Keris Film in Singapore in 1955 and his artistic career took off after he acted in Pendekar Bujang Lapok. Mustapha first carved a niche through Hang Tuah and he was regarded for his dashing good looks. It came as no surprise that Mustapha became the toast of the town then. His legacy remains evergreen, and the good-natured, kind-hearted and dedicated star will be fondly remembered by his fans in Malaysia, Singapore as well as Brunei. Mustapha, whose full name is Mustapha Azahari Maarof, received the Veteran Award at the 10th Malaysian Film Festival and the 2010 Finas Film Personality. In recent years, Mustapha had acted in 1957 Hati Malaya (2007) and the 2009 Lembing Awang Pulang Ke Dayang. His wife, the late actress Roseyatimah whose real name is Rosnah Jasni, died in Dec 14, 1987. Mustapha was survived by three children, in-laws and seven grandchildren.